"So what is inside? Who knows? Hopefully it isn't mushy soup." Thursday afternoon found the museum staff at the Bay County Maintenance building as the Kennedy Time Capsule vault was wheeled out into the light of day. Expectations were not high considering that the box had dripped and drained all night. Where it had rested was a large puddle that trailed off to a floor drain. As the 2:00pm opening time approached a small crowd of media and spectators arrived. The opening was to be by invitation only because it had been planned for the museum where space was very limited. After seeing the size, weight and condition, the County volunteered their building and parking lot at the fair grounds. Right on time, Ron Bloomfield, Museum Director, Chief Historian and curator, called for attention. He welcomed those present and said the plan was to drill some test holes that would first let out any accumulated fumes or gas then the would figure out the next step. "It's a big, heavy vault" he said. "We don't know what we'll find". As museum staff members, Bloomfield, Gordon Kukulis and Emily Radlinski all followed protocol and wore respirators. Everyone else just backed up a ways and tried to stay upwind. The first hole Ron drilled went without incident so he drilled the other corners. After probing with an old toothbrush and getting an idea of thickness, Ron pulled out a skill saw, set the depth, and began to cut a long slice. There is no exact record of how the vault was constructed. What there is implied that it was a plywood box clad in sheet metal and lead. Examination showed that there was also a layer of tar in there somewhere... it was visible at the corners. After the first access cut, Kukulis used a paint scraper to probe inside. He soon switched to a prybar. He and Bloomfield peeled back a corner of quarter inch lead (which accounted for some of the weight). After more careful examination Bloomfield finished making a rectangular cut all around the top. Crowbars came next and the newly cut "lid" was lifted. When no hazards were discovered, the crowd was invited to come take a look. Inside were piles of plastic packages covered with dirt and some mud. Some of those packages looked like the contained mold. A few inches below the first packages was WATER; lots of water! The crowd backed up and Bloomfield lifted our the first of the many packages. It was dirty but didn't look too bad. The next few, however, showed that water had in fact entered the bags and many were half full when held up. Although the contents were not entirely "mushy soup", there was enough paper not wrapped in plastic to insure plenty of mush floating in the gray water. That part looked like the aftermath of some natural disaster. The next hour was occupied with emptying the top layers, pumping out some of the water, and pulling up more items. Besides the plastic bags there were kitchen utensils, some high button shoes and other artifacts. The bags were clipped to drain the water. Everything was carefully examined then put into plastic tubs which had been brought for the purpose. (Before long Bloomfield was heard to day "we're running out of tubs." There was a lot of material in that vault). A number of artifacts were obviously much older than 50 years. Bloomfield said that the County was celebrating it's 100th anniversary when this capsule was buried and it was thought that they included items that were 100 years old at the time. "We think that some artifacts provided by the Historical Society are in there" said Bloomfield. Among the artifacts was Bay City Centennial commemorative tableware. The plates just kept coming up from the dark water. When asked how many there were, Bloomfield just said "lots". Then he laughed and said "probably enough to seat the entire cast and crew of Rent". 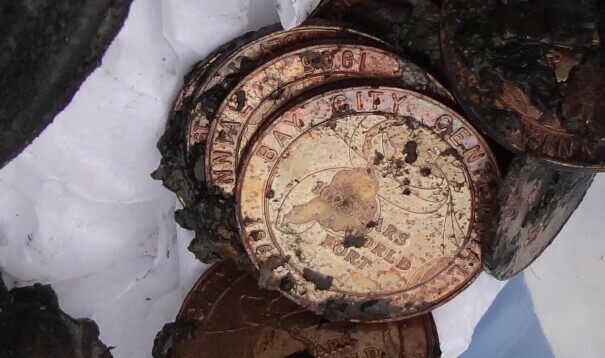 There was also a handful of Bay City Centennial coins. That was about as close to "treasure" as the crew got. The few well wrapped, and therefore mostly dry, packages presented an opportunity to open something in public. With a crowd of onlookers, Bloomfield carefully cut the outer plastic wrapper of a selected package and peeled it back. Inside was another package of heavy paper. An inside layer of aluminum foil was finally removed to revealed a catalog with fashions of 1965, some brochures, a few church publications, and some Union and UAW documents. Even though there is water and other obvious issues, Bloomfield said "there are still valuable things in here". The limited records indicate that there were letters written to future generations and placed in the vault. "We hope that the letters are found and are still usable" said Bloomfield. As everyone left there was still more yet to be removed after the remaining water is drained. There are some artifacts which may be displayed at the Sesquicentennial celebration between City Hall and the Museum on Saturday. Over the coming months the other contents will be carefully examined . Where possible the best or most important will be dried in the freezer at the museum. That process can take over a year. This record of the past seems destined to reveal its information well into the future.